Today, I’d like to address a subject that I see a lot in people, shoulder and neck tension. Many have told me that this is getting in the way of their fitness goals. 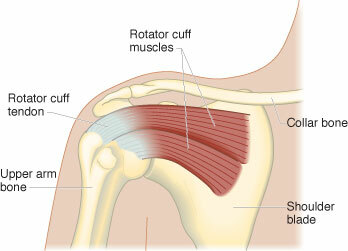 I also see a large amount of shoulder injuries due to lack of strength and flexibility in the rotator cuffs. Another cause of injury is that many people use bad form due to lack of posture awareness or muscle imbalances that have not been addressed. Lack of core strength ’causes people to overcompensate by straining their neck and shoulders. Lifting weights adds stress to an already dislodged area, aggravating the issue. Another reason this has become such an epidemic is because people simply do not know how to relax. Living in a “no pain, no gain,” society has made us tense up, thinking that holding on to stress will somehow get us somewhere. How did this happen and how can we address these issues? Unfortunately, many of these problems start in elementary school where children are forced to sit in chairs for long periods of time. These chairs are rarely created to fit their size. They are also forced to carry heavy back packs. Sadly, I see many teenagers enter my classes with the kyphotic hunch of an older adult. To make matters worse, children grow up to be adults who live sedentary lifestyles, often making a living by sitting at a desk, hunched over a screen. A reliance on texting and portable devices has developed a society of people who spend more time hunching over a screen than they do anything else, not to mention the fact that we drive this way as well. If you watch a a toddler or pre-schooler crawl, walk, squat, lunge and pick things up of the floor, you will find they use perfect form. The imbalances start when television, video games, and forced chair sitting creep into their everyday lives. Until recently we have evolved to move our shoulders, to hunt, throw and dig with our upper bodies. In our modern society, a lack of proper movement has caused the muscles that support our scapulae to weaken and become inflexible. An average sedentary American doesn’t lift his hand higher than his desk. This lack of movement leads to inflexibility and weakness in our core muscles. Also, many people work in awkward positions, spending all day with their head thrusted forward to read the screen. This puts the alignment of the spine out of balance. The weight of the head (about ten pounds) causes the spine to fuse in an unnatural position. 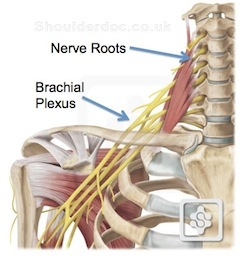 The tightness this brings to the shoulders and neck can cut off nerves that run down the arm and into the fingers, causing pain and numbness in the wrists. Often, neck impingments are misdiagnosed as carpel tunnel or tendonitis of the wrists. How do we address imbalances in the neck and shoulders? Since most imbalances and chronic pain are caused by things we do everyday, we have to look at how we move when we aren’t exercising. Are we contorting our bodies unnaturally in order to fit into our work spaces? 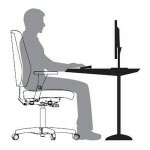 We need to make sure that we can lean back on our chairs without curving our backs or stressing our shoulders. Our keyboards should be close enough to us so we don’t have to reach our arms out to type, causing tightness in the front of our shoulders. Are we hunching forward in order to read the screen or do we make the characters on the screen larger so we can see them while balancing our head on our neck where it should be? There is a sheath of tissue surrounding our muscales and organs known as “fascia.” This tissue gets tighter the more we move in the same ways. If we hold our posture in an incorrect position for too long, the fascia hardens in that position and it is very hard to release it. Also, our muscles can get swollen. This makes it very hard for blood to circulate. We start forming “knots” in our shoulders and neck that can only be released through myofacial techniques such as massage. Fortunately, we have found many ways to use self massage by using foam rollers and small balls so we don’t have to pay for a regular weekly massage. 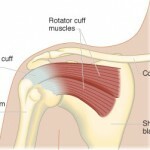 Once we have softened our fascia and reduced swelling in our shoulders, we are more able to move this area. The weaker we are, the more likely we are to get sore. The smallest things will ’cause pain. Most people have weak rotator cuffs (the muscles that surround and protect the shoulder blade) Due to lack of movement, these muscles lengthen and get weaker, making it hard for us to sit straight,with our shoulders back and down. In order to fix this imbalance, we must strengthen our upper back and the back of our shoulders by rowing, pulling down, or just drawing our upper back muscles down. It is imparative that we strengthen these muscles that protect our shoulders if we have trouble standing straight with our shoulders back. Doing advanced weight training with weak rotator cuffs can cause injuries in the lower back and shoulders. Also, our dependence on chairs and machines has made our core muscles completely dormant. Often, people strain their necks to make up for lack of strength in their torso. Living in a “no pain, no gain” society has made us create pain for ourselves. Our subconscious belief that pain will lead to gain has caused many people to hang on to pain, thinking it will lead to success. In reality, this tension is an obstacle to health and freedom. Fortunately, there are meditations and stretches we can do to change this pattern. Poor posture can constrict the muscles that allows us to breath deep into our diaphram. Since our body needs oxygen, lack of proper breathing can cause more lack of circulation and anxiety. This leads to more shallow breathing. Instead of using the diaphram, shallow breathers use muscles that lift the shoulders, causing even more strain. During my NECK AND SHOULDER RELEASE workshop, we will learn how to address these issues without relying on a massage therapist or chiropracter. This workshop is designed for people who suffer from chronic tension in the shoulder and neck while at work or during exercise. It is not geared to people who have an accute injury that may require a specialist or surgery. During this workshop, we will learn to assess our own imbalances by applying techniques using ergonomics, mobility movements, myofascial release, core strengthening, relaxing stretches, breathing and meditation that teach us to let go of our stess and prevent us from being stressed out by others. I will be providing the best information on this subject after many years of being a personal trainer, pilates and yoga instructor. I will also offer mind/body techniques I have learned from studying the Alexander Technique and chi kung. I definitely needed to read this… I am constantly feeling “crunched” in my neck and even avoided doing abs in your class last night because my neck hurt! As a fulltime writer I’m pretty much bound to a desk all day, but I will try some of these tips! When you crunch, work first on squeezing your abs really tight. Make sure the tension in your abs is what is causing your spine to curve. If your abs get tired, your neck will take over. You stop squeezing your abs and start lifting your neck off the floor, doing what I call, neck exercises. Lol. If your mid section gives up, take a break and continue when rested.